This is an aggregation of all known NG Blogs. There's also a fullscreen version of this page. You can subscribe to the planet feed using this RSS Feed. Welcome back to my blog, esteemed reader! In June, we organized the 11. UAVP-NG Multicopter Meeting in Zurich, Switzerland. It was a great event with good weather. Lots of folks joined and we had a lot of fun. Besides that Ralf, one of our software and hardware developers, finalized the first prototype of the new HW-0.30-mini in the last month. 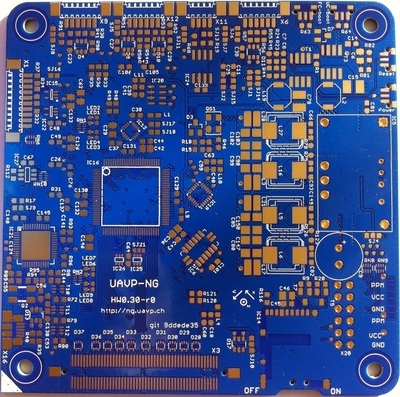 We sent the Gerber files to our chinese producer and two days ago we finally received the first prototype PCB of the new UAVP-NG HW-0.30-mini-r0 boards! The boards look great. I used my new Fujifilm X-T1 to take the pictures. It seems I still need to learn a lot - finding nice lightning was not easy and I finally resorted to normal sunlight, after failing to get sensible pictures using two table lamps. 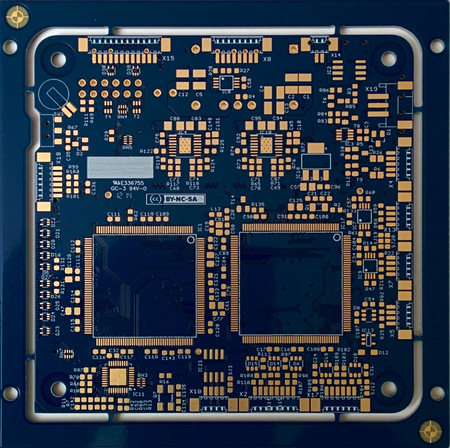 The new HW-0.30-mini-r0 PCB in 6 layers has our classic 'mini' hardware size of 55x55mm. All features of the bigger hardware are included - except the second STM32F4 CPU and the dual port RAM, which wouldn't fit on a PCB of this size. The boards look nicely made and I hope we will get them airborne soon! In the next weeks we will assemble some of the new PCB and test them throughly. Should everything be fine, the new PCBs will show up in the UAVP-NG Shop. So, let's see... The UAVP-NG team was meeting at the 30. Chaos Communication Congress 30C3 in Hamburg. The congress gets organized by the Chaos Computer Club, one of the oldest hacker clubs of the worlds. As every year, it was a great event with numerious interesting talks and workshops. 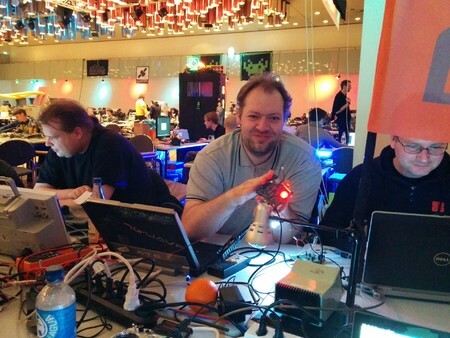 Our team built a small UAVP-NG assembly at the 30c3. We showed our different copter hardwares, did a lot of software and hardware hacking and had many interesting discussions. Volker - one of our hardware head developers - brought with him the first assembled HW-0.30-r0 prototype which you can see Volker presenting here at the 30c3 assembly in Hamburg. This is the first prototype of our new STM32F4 based HW-0.3x hardware family. It's feature list is impressive and I will introduce you to it's features further on. Most of our head developers showed up to the 30c3 meeting and we did a lot of NGOS hacking to get our newest hardware airborne. Several small bugs on the PCB had to be fixed and Volker, Ben, Martin and several others did a great job in tracing the problems of our newest prototype. 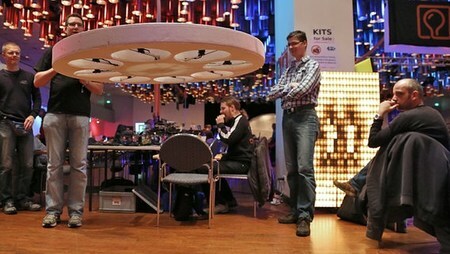 Christi brought with him his new styropor oktocopter which he flew inside of the 30c3 hackcenter. Shortly after 30c3 the UAVP-NG core team meet in Zurich, Switzerland for a hacking weekend. There we finished the last hard- and software fixes for HW-0.30-r0 and did the first maidenflight of the new hardware prototype. 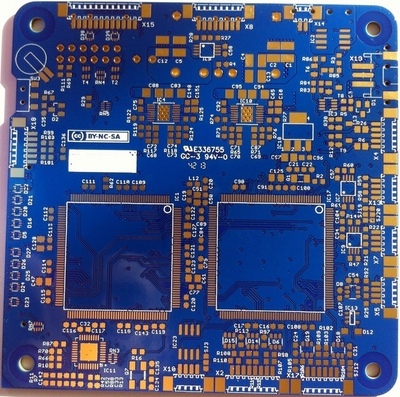 In the days since the maidenflight our hardware developers prepared HW-0.30-r1 and we produced a first batch of the new boards, accompanying breakout boards for switches and a JTAG adapter as well as a new NGusb-v2 which supports 6-pin RTS/CTS connections with flow-control and 4-pin UART connections without. As you can see, the new hardware sports two STM32F4 CPUs coupled by a dual-port RAM, shared by the two CPU. In december 2012 the whole UAVP-NG team meet at the 29. Chaos Communication Congress in Hamburg. It was a great event with many interesting talks. Many of our pilots, beta-testers and developers joined the UAVP-NG assembly and we had a lot of fine discussions, hacking, talks and fun. Many visitors came by at the assembly and all of our developers and beta-testers were constantly explaining and showing our new hardware HW-0.24-mini-r1 and the NGOS software. 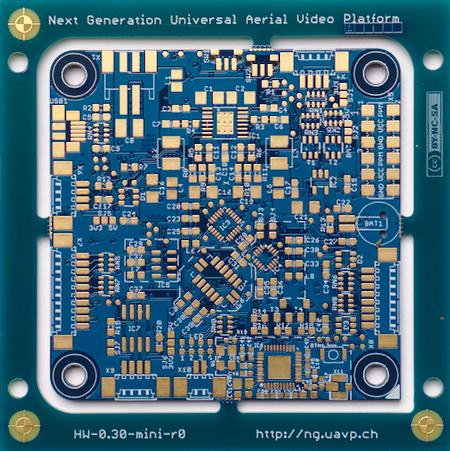 Our team started to design a new hardware revision, called HW-0.30 at 29c3. Volker, one of our hardware head developers, took the project lead. We discussed and designed the features of the new hardware revision during the 4 days the congress lasted. Having defined most of the feature set the real design work on the new hardware revision was done later in early spring by Volker together with Ben and Martin. In early May the 9. UAVP-NG Developer Meeting took place in Zurich, Switzerland. Sadly we had bad luck with the weather and we got rain for most of the 4 days. On the other hand this gave us a lot of time to discuss the HW-0.30 design and our hardware team verified the new design pin by pin and chip by chip. In the night I myself did two long hour talks on NGOS and it's implementation for my fellow developers. The design of the new hardware had already progressed a lot and the new design looked promising. Later on in July Martin invited us to the 10. 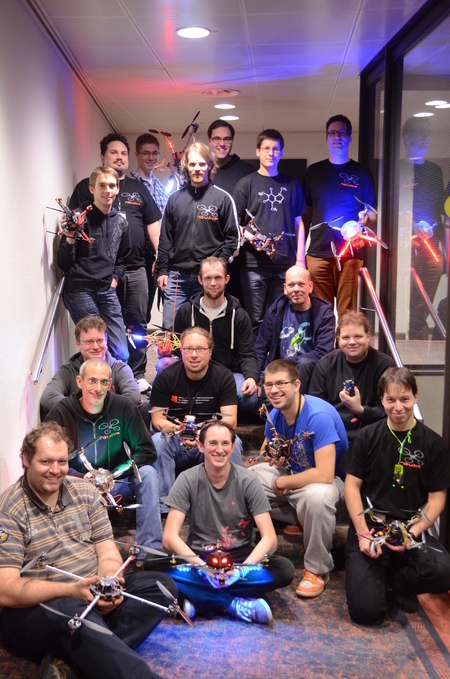 UAVP-NG Developer Meeting, which took place in Gruenstadt, Germany. The weather was wonderful and we enjoyed two great flight days. The design of the new HW-0.30 was nearing completion and we started to plan production of the first prototypes. This fall, we implemented a new fully autonomious looping function in NGOS which Christi, one of our developers, implemented while doing a lot of crash intensive testing. It essentially allows you to do fully autonomious loopings on the press of a button. Over time the new looping function was perfected and Ralf, another of our developers, demonstrated the new feature in a great movie some days ago. End of september we finally ordered the first HW-0.30-r0 prototypes. The board will feature two STM32F4 CPUs with a dual-port RAM in between them allowing both CPUs to have near realtime sensory data and synchronisation. It will support a CAN bus ring additionally to the I2C bus for BLCs. A lot more improvements were incoperated and I will post more on this in a later post. We plan to design a HW-0.30-mini later on, when the HW-0.30 design has been stabilized and has proven itself. The HW-0.30-mini will contain only one of the STM32F4 CPUs and will not use a dual port RAM. This will allow to build it with a 55x55mm footprint similar to the earlier HW-0.24-mini and HW-0.22-mini PCBs. It will provide a nice upgrade path for all our HW-0.24-mini and HW-0.22-mini pilots. The HW-0.30-r0 prototypes will now be delivered to our developers and we can hope to see fully assembled HW-0.30-r0 boards soon. If we are lucky and our software developers find time for the final touches on the NGOS STM32 port we will eventually see the first prototype get airborne at the 30C3 - The 30. Chaos Communication Congress in Hamburg where all developers will meet again for the UAVP-NG Developer Meeting at 30C3. If you are interested in the UAVP-NG and live near Hamburg, make sure to visit us between the 27. and 30. december at the 30C3 in Hamburg!